Form the sausage into 3 patties and cook them in a frying pan or on a flat grill until browned and done throughout. Pour the frying oil into a frying pan so it is about a half-inch deep. Heat oil to 350°F. Mix the Bisquick, apple, milk, and one egg, and stir to combine. Split the batter into thirds and drop into pan with hot oil to form rounds. Flip once during frying. Fry until golden brown on both sides, about three minutes per side. Remove from the pan and onto a drying rack, and immediately sprinkle with cinnamon sugar on both sides. Top the sausage patties with cheese to melt, and begin to fry the eggs in a frying pan or flat grill. Slice the fritters in half horizontally to form a top and bottom bun. Place the sausage patty with cheese down first, then the fried egg. Add the fritter top, and serve immediately with garnishes as desired. As the recent burger craze continues, more and more burgers become over the top. I love burgers, and I love over-the-top food, so you guys can imagine that this is right up my alley! A few years back, the trend was putting a burger on a donut. This version takes that idea into a new direction by putting a sausage burger onto an apple fritter, a style of donut that has fresh apples and cinnamon sugar. 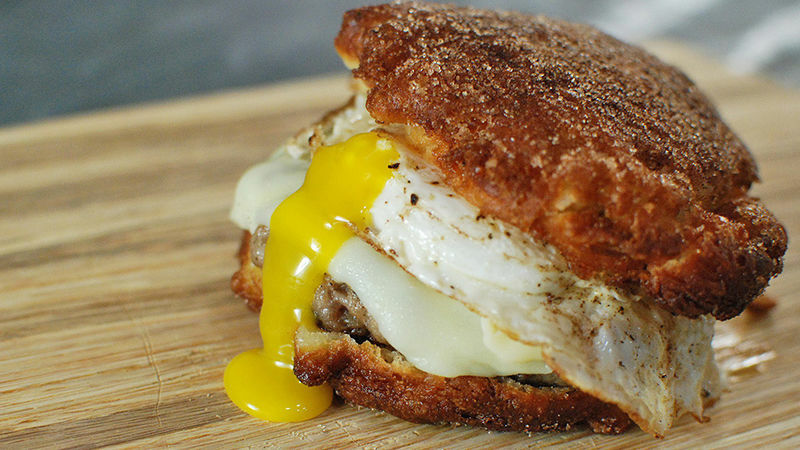 I also added a fried egg to my fritter burger, because come on – it's breakfast, right?! Apple fritters are easy to make. Just mix Bisquick with apples, egg, and milk. Meanwhile, cook up the sausage patties. Ok, the batter is ready. Shallow fry it on both sides until it is fully cooked, and nice and brown. Hit it with some cinnamon sugar right when it comes out of the pan. Oh yeaaaaaah. Honestly, no matter how many bells and whistles it has, the best part of any breakfast sandwich for me is the oozing egg. This is quite the way to start your day! Dan Whalen had his first apple fritter in preparation for this recipe. He has been blogging for over 6 years at The Food in my Beard; Check Dan's Tablespoon profile often to try his recipes with creative international spins!